The main effect of metformin is inhibition of the mitochondrial transport chain complex-I, which essentially poisons the mitochondria. High levels of metformin are the primary cause of illness. Acute poisoning may lead to MILA in the absence of renal dysfunction. Patients with acute ingestion look fine initially, but deteriorate subsequently (“toxin bomb”). Progressive renal failure (with GFR << 30 ml/min) eventually leads to metformin accumulation and toxicity. These patients may present with marked lactic acidosis, yet have fairly preserved hemodynamics and look OK. Patient on metformin develops an acute life-threatening illness (e.g. septic shock, cardiogenic shock). Metformin amplifies the degree of lactic acidosis, but it's not the sole cause of the illness. Risk factors include renal insufficiency, higher doses of metformin, and alcoholism. Metformin levels are low; metformin is an innocent bystander. Differentiation of MULA from MALA requires measurement of metformin levels, which isn't available at most hospitals. Hypotension progressing to vasopressor-refractory shock can occur. GI symptoms often predominate: Nausea, vomiting, diarrhea, epigastric pain. If infection is possible: Blood cultures, urinalysis, chest X-ray, procalcitonin. If intentional ingestion: Additional toxicologic evaluation (e.g. acetaminophen, salicylate levels, toxic alcohols, carboxyhemoglobin). Note that many patients may be ill due to a combination of metformin plus an acute illness. Therefore, a thorough search must always be made for any additional causes of physiologic stress. Compared to isolated DKA, patients with metformin-induced lactic acidosis have greater degree of hyperlactatemia, with less extensive ketoacidosis. It can be very difficult to sort this out in some situations. When in doubt, treat both conditions (the treatment for DKA may actually improve MILA/MALA). More on treatment of this below. 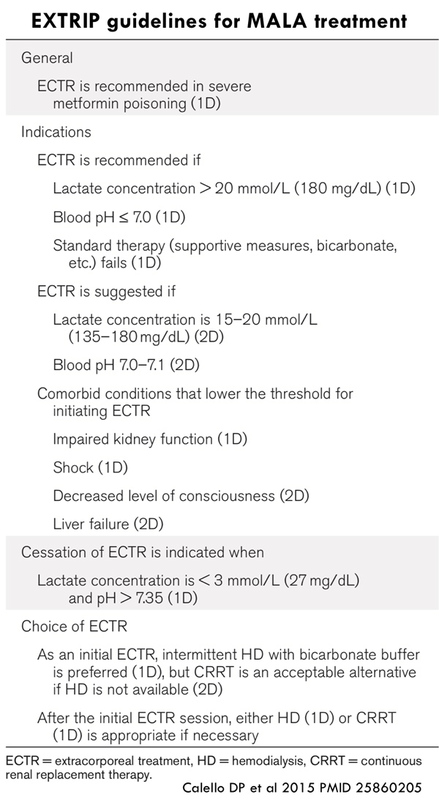 Lactate level and pH seem to lack prognostic significance in these patients. The reason for this is that historically patient cohorts have contained a mixture of MILA, MALA, and MULA. With such a heterogeneous group of patients, prognostic relationships get muddied. Activated charcoal may be considered for patients who present very shortly following acute ingestion, without contraindications (e.g. normal mental status without risk of aspiration). Evaluate for alternative causes of illness, especially septic shock. If sepsis is possible, consider empiric antibiotic therapy (along with further diagnostics, including blood cultures and possibly procalcitonin levels). Antibiotics may be discontinued within 24-48 hours if additional evidence of sepsis doesn't emerge over time. Provide IV dextrose as needed. 2) treatment of diabetic ketoacidosis? Metformin itself may promote the catabolism of fats and production of ketoacid. Metformin may cause hypoglycemia (so the patient may not have features of classic diabetic ketoacidosis). In some cases, it may be hard to sort out whether the patient has euglycemic DKA versus metformin poisoning (and to some extent this may be a linguistic issue). A case series of three patients with metformin-associated lactic acidosis and concurrent euglycemic DKA reported clinical improvement when treated with glucose infusion and dialysis alone (without an insulin infusion).4 This suggests that the presence of ketoacidosis alone doesn't mandate insulin therapy. However, persistent euglycemic DKA which doesn't improve may be an indication for insulin therapy (more on euglycemic DKA here). 3) glucose, insulin, and potassium (GIK therapy) ??? If given to patients with normal glucose and potassium levels, then insulin must be accompanied by the administration of glucose and potassium (hence the name “GIK therapy”). GIK therapy cannot be recommended for routine therapy. However, if nothing else is working and the patient is actively dying, this might be worth a try? Assess volume status in the usual fashion and replete as necessary to target euvolemia. Patients won't necessarily be hypovolemic, but they may often be. Might increase cellular permeability to metformin. Bicarbonate has never been shown to be a useful therapy for lactic acidosis. Normal saline is an acidotic fluid that will exacerbate the acidosis. Lactated Ringers isn't a good choice, as these patients cannot metabolize lactate. Plasmalyte or normosol aren't good either (they contain acetate which is normally metabolized into bicarbonate via the Krebs cycle – but may not be metabolized properly in this situation). (1) D5W with 1/2 normal saline, plus one ampule (50 mEq) of bicarbonate added per liter. If the saline is infused about six times faster than the bicarbonate, the combination will produce an isotonic fluid with an effective bicarbonate concentration of 25 mEq/L (Strong Ion Difference of 25 mEq/L). This allows you to resuscitate mostly with normal saline, but at the same time not exacerbate the acidosis. Intubation usually isn't necessary (if it is, increase minute ventilation to compensate for acidosis). High-flow nasal cannula may be used to improve ventilatory efficiency and reduce the work of breathing, for a patient with substantial acidosis and Kussmaul respiration, who is at risk of tiring out. In this application, the flow rate should be increased as high as tolerated, with a low FiO2 (e.g. 50-60 liters/minute flow with 30% FiO2). Full text of the EXTRIP guidelines on metformin here (PDF of Calello DP et al 2015). In addition to the above criteria, the overall clinical context and diagnosis needs to be considered. For example, in a patient with a pH of 6.95 due mostly to a non-anion gap metabolic acidosis (with a lactate level of 3 mM), dialysis might not be needed. The benefit of dialysis is probably greatest in MILA patients, with extremely elevated metformin levels. It should ideally be continued until the lactate <3 mM and pH >7.35. Hemodialysis is preferable to continuous renal replacement therapy (to achieve adequate clearance of metformin). The main problem in metformin-associated lactic acidosis is blockade of electron transport at Complex I on the mitochondria. Methylene blue is capable of accepting electrons from NADH and transferring them to cytochrome c in the mitochondria (bypassing Complex I).10 This should function as a bridge to re-establish the flow of electrons through the mitochondria. Theoretically this could be a silver bullet which re-starts the stalled Krebs cycle and re-establishes normal metabolism. (2) Vasoconstriction: Methylene blue can also function as a vasoconstrictor (by scavenging nitric oxide). It's possible that its efficacy in some cases of refractory shock with metformin toxicity is due purely to its efficacy as a vasoconstrictor. G6PD deficiency is a contraindication, as methylene blue may increase the risk of hemolytic anemia. May be considered in cases refractory to conventional therapy. Under-diagnosis: Failure to consider metformin as a cause of lactic acidosis. Over-diagnosis: The assumption that all patients with metformin and lactic acidosis have MILA (without any other problems going on). This assumption could lead to overlooking simultaneous problems, such as septic shock plus MALA. Trying to fix metformin-induced lactic acidosis with large-volume fluid resuscitation. Unless the patient is hypovolemic, fluid isn't the answer. Failing to initiate dialysis in a patient who is extremely ill and meets guideline criteria for dialysis. It's hard to know precisely which patients will benefit from dialysis, but there are probably some who need dialysis to recover. When in doubt, consult your toxicologist and consider a trial of dialysis. Goldfrank’s Toxicologic Emergencies, 10th Edition, 2015, Chapter 53 by George Bosse, Page 729.